This post is about amplifiers, how they work, and common applications. I will cover several operational amplifier configurations, and situations where each might be useful. This is part I of II for general discussion about amplifiers. Enjoy! Definition (for Bioinstrumentation): Circuit that makes a small signal, usually voltage but occasionally current or power, big enough to do something useful–including excite an output mechanism. ratio (usually in dB) of the amplifier’s common-mode gain to its differential-mode gain. Common-mode signals are input signals common to both + and – inputs and are usually unwanted noise–60-Hz, thermal, etc; differential signals are applied to only one input. voltage out over voltage in, or current out over current in. May be given in dB. Bioamp requirement: often adjustable; should be 1000 or greater, should be calibrated. 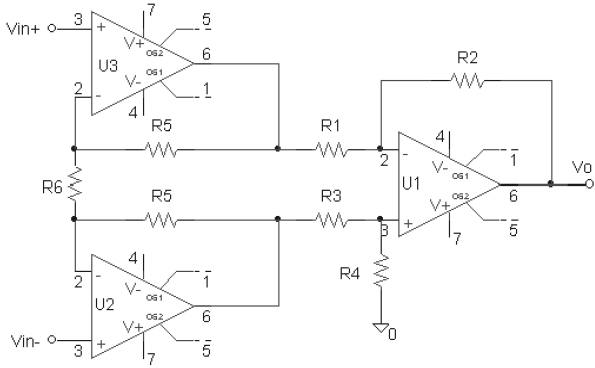 what the input source sees as its load working into the amplifier: if the entire amplifier circuit were modelled as a resistor, what would be the value of the resistor? 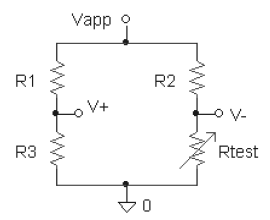 Typical bioamp: Rin = 10MΩ–signal source need not provide much current. same as input impedance but from the output end: model the entire amplifier as a source, and this is its internal impedance. Bioamp requirement: Ro << Rload. over what range of frequencies is the gain constant? Graphically illustrated with a Bode plot of gain vs. frequency. usually an amplifier has an operator-adjustable DC offset knob, to null out any offset associated with non-ideal amplifier or sensor behavior. A DC offset signal results in an incorrect reading unless removed or filtered out (high-pass filter). • equal input voltages –> within the limits of external power supplies, an op amp outputs whatever current is needed to drive the two input voltages equal. Result is that the output voltage follows the input, scaled by a large gain. 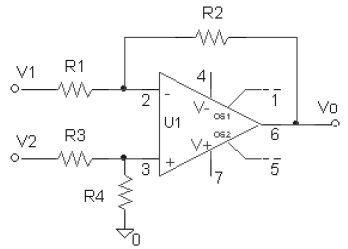 • infinite input resistance means the op amp never loads down the source, even if the source cannot supply much power. • zero output resistance means the op amp is an ideal voltage source, with output voltage independent of whatever load impedance it must work into. • infinite open-loop gain means the amplification properties of a circuit containing an op amp are independent of the op amp internal properties. Carr and Brown go through several common op-amp configurations and show how to derive their voltage gains. Suffice it for now to know that if you want to build an amplifier, an op amp is a good place to start. This schematic illustrates the important properties of the op amp, and of any amplifier. It can also make it easier to understand circuit operation. must be zero to get a finite output. Example: derive the gain relationship for the basic differential amplifier shown, assuming U1 is ideal and Vin = V2 – V1. To get equal gain of both V1 and V2, set R2/R1 = R4/R3. Then Vo = R2/R1(V2-V1). To get a high gain, R2 >> R1, but to get high input impedance R1 (and/or R3) should be large, making R2 and R4 even larger…Result: high gain and high input impedance are difficult to achieve together. A difference amp with input buffer/gain stages to increase input impedance and gain. To analyze, realize that the same current must flow in R5, R6 and R5 (since no current flows into the op amps). Set R1=R3, R2 = R4; then Vo = G1* (v3(U1) -v2(U1)), where G1 = R2/R1 = gain of second (differential) stage. Gain of input stage is 1 + 2*R5/R6 = G2. Overall gain is G1*G2. Making R6 a potentiometer allows compensation for inequalities in the two R5s, as well as for variable gain of the entire circuit. Overall Gain: A practical difference amp can have a gain of 100, so it is not hard to get an overall gain of 10,000 from an instrumentation amp. Output Impedance: close to that of the op amp U1–very small: the amp will provide whatever current is needed to maintain the output voltage regardless of load impedance. Equal resistors: in practice one cannot buy matched discrete resistors; however it is fairly easy to manufacture them within an integrated circuit. Monolithic diff-amps are available. Gain: TANSTAAFL–you cannot have gain without a power supply to provide it. Real gain is limited by the external power supplies (+/- 12 or 15 V, for op amp circuits) Exceeding the limits of the power supply results in Saturation, or “hitting the rail”. Output impedance: a zero output impedance means the circuit will provide whatever current is needed to maintain the requested output voltage. Practically, however, an op amp can only provide some 20mA, meaning RO is negligible only for RL>>15V/20mA = 750 Ω. Frequency dependence: to avoid oscillation or saturation, circuitry must often be added that limits the bandwidth of an amplifier. 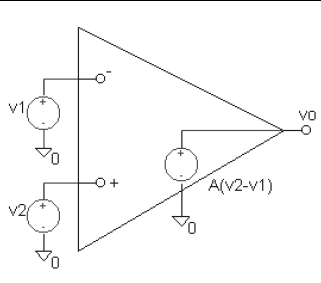 • To keep DC offset signals (from polarizing electrodes, for example) out of the amplifier, a high-pass filter is used to cut off DC (and lower-frequency ac) signals. • If the load to be driven contains substantial capacitance, the current output limit again becomes a problem, limiting gain at high frequencies, where capacitors look like shorts. Input bias current: real op amps do have non-zero input currents, which produce voltage drops at the input–another source of DC offset. This source can be minimized by using FET op amps. Often the measurand is the relation between voltage and current (one applied, the other a response) rather than a biologically generated source. An example in Carr and Brown uses a wire heated by an applied current as an airflow sensor: air flow from a breathing patient cools the wire, changing its resistance. Similarly, a voltage applied to a membrane induces a current flow; the ratio of voltage to current is a resistance. Such relations are best measured using a Bridge, and if the bridge is made solely of resistors it is called a Wheatstone Bridge. The impedances can have capacitance and/or inductance associated with them, in which case the bridge can measure both energy storage and resistive loss in an element. A return path to ground for (DC) bias currents is automatically provided by this circuit to prevent saturation. Well there you have it, a few common amplifier configurations and some useful terms pertaining to them. Remember important concepts such as amplifier saturation, Input Impedance, Output Impedance, and Gain. A solid understanding of these concepts is sure to impress somebody! Amplifiers part II will continue to elaborate on more fun amplifier concepts.